Loyalty….Betrayal…Revenge. 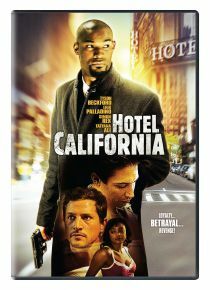 Revenge comes full circle in Hotel California when three former partners (Troy, Pete, and Al) with strong connections to the underground crime scene of L.A., reunite in a dingy hotel room to rehash the past. Anxiety builds as they take part in a calculated mind game of wit and loyalty. Hotel California checks you into a twisted world of crime, drugs, and murder, where tension mounts, bullets fly, and blood flows. You may not have heard of Maya Entertainment but you have heard of the actors in this movie. Just by looking at the cover, I was intrigued to find out what was going to happen. With the eye candy, Tyson, Eric, and Simon this movie was great to watch. It was action packed. And just when you think you have the movie figured out, it all unravels differently. There were guns, blood, fights, and a whole lot of action. The movie had a great plot that keeps you entertained. This is a great movie to watch. My fiancee and I both really liked it. We both recommend you grab this dvd. It was released back in March. And it is out now. To check out the trailer, go to Hotel California.